Water Reed… from the marsh, to the ladder’s foot. Water reed, is a truly global thatching material. Used in turn, by native North Americans and Japanese farmers. The second element of its Latin name, australis, gives some idea of this plant’s range. The reeds grow in both fresh and salt water. Either in the shallows; or on marshy ground that is frequently inundated with floods or tides. 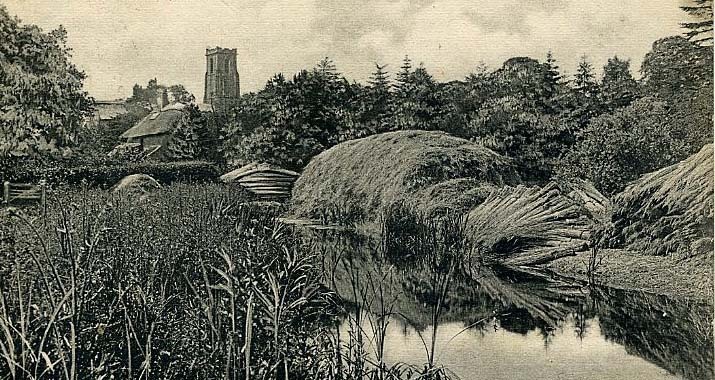 It has been calculated, that a quarter of Britain’s landscape was once like this, making water reed a useful and widespread material for our distant ancestors. Water reed, growing happily, along with some common rush… A thatching resource, used by peoples all over the world; since before the dawn of agriculture. 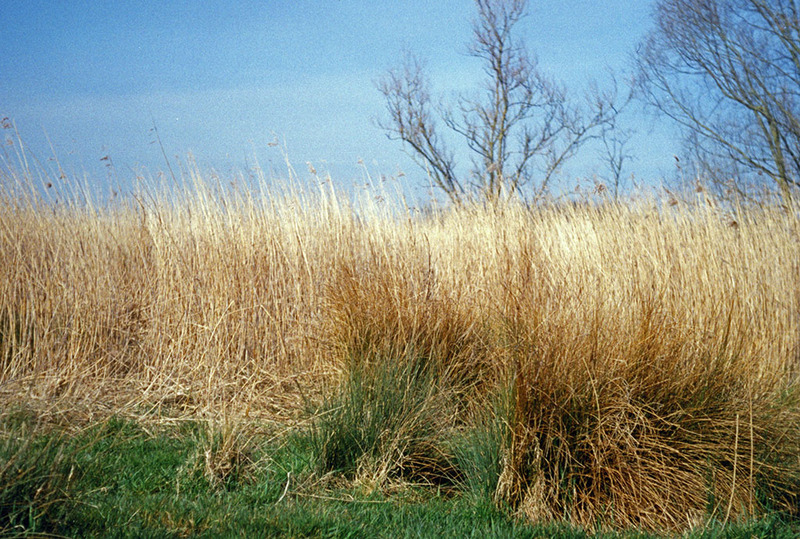 Water reed is a managed wild species, thus it does not have to be planted each year. But the reed beds do need maintenance. The traditional way, to bring a suitable reed bed into production, is to burn the old standing reeds during the winter for several years. In each successive spring, the young plants, called Colts, grow increasingly straighter as their progress is not impeded by the dead growth of previous years. The longer the bed is in production, the better the quality of reed. The plant grows annually to a height of between 3 and 8 ft. (900mm and 2.6m). Being distinguished by its feathery seed head and spear like leaf shape. The reed is cut in the winter months, before the young colts emerge in the spring. Usually frosts are allowed to kill off the reed before harvest and a fall of snow helps to strip the leaves from the stem. 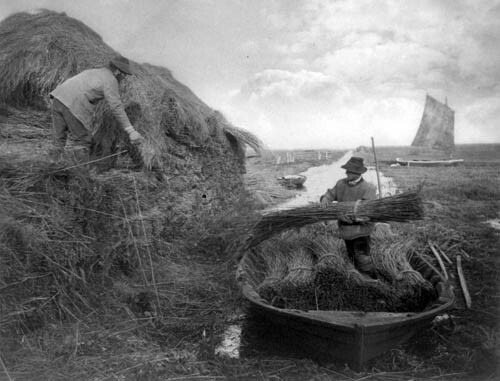 Nearly all reed is harvested annually; being known as First Wale reed. Occasionally a reed bed needs a biannual harvest and this becomes Second Whale material. 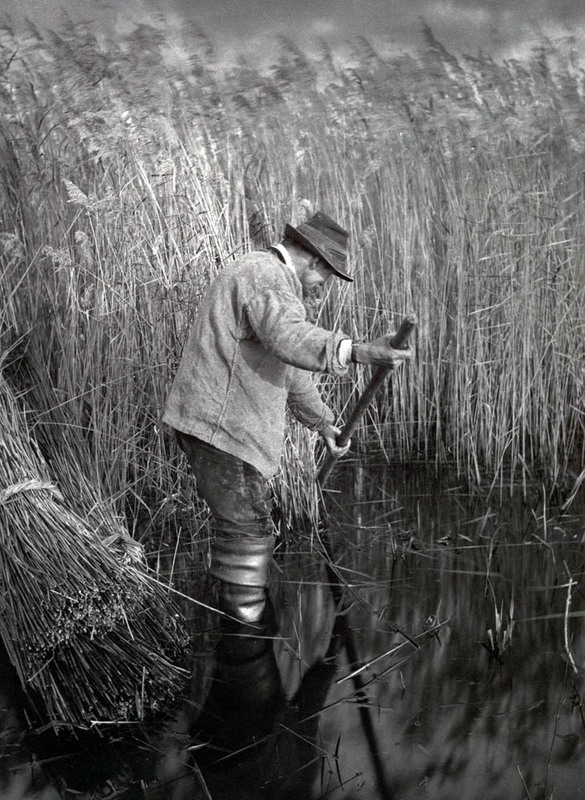 The method of harvesting the reeds, has changed over the years. Becoming more mechanized and a little less labour intensive. The traditional way of harvesting, is by using a scythe or a sickle. With the harvester, both cleaning the reed and tying it into bundles, as work progresses. A hundred bundles a day, is reckoned to be a good cutting rate. Being a wild plant water reed grows much less thickly than cultivated cereals. 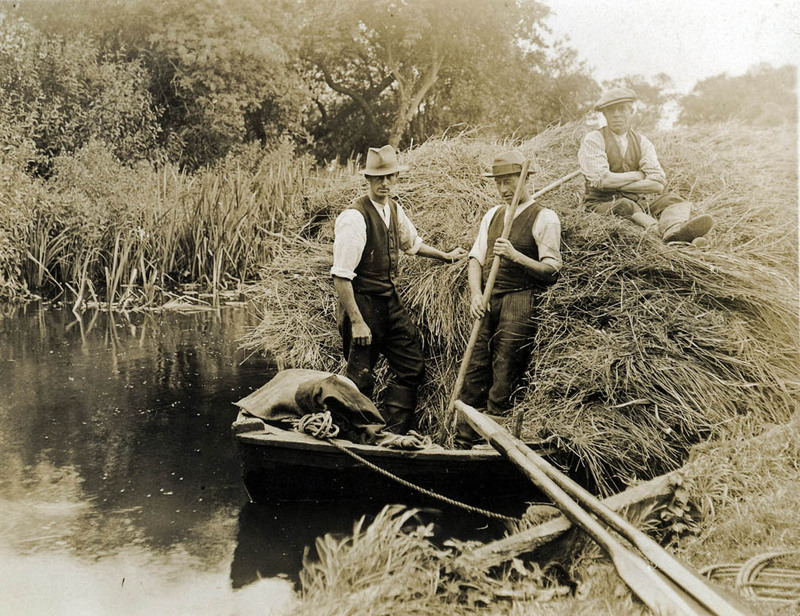 An acre of decent reed bed produces around 300 bundles of material (750 bundles per hectare). 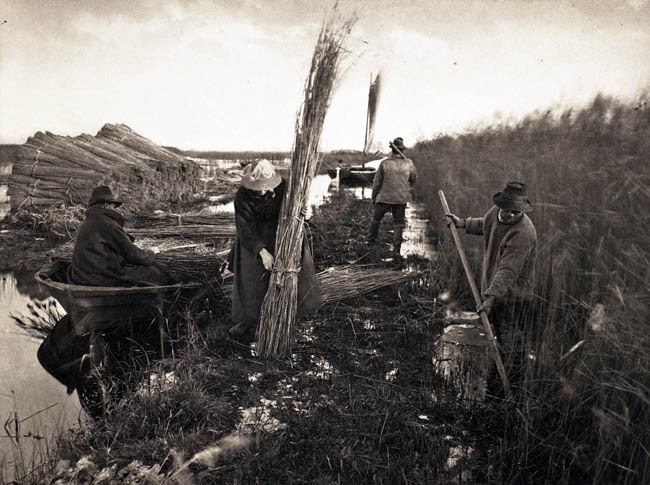 Mr Emerson’s images show the four workers and their winter conditions well; with women tying and bundling the reed, with snow on the ground… And, with the wind in the wrong direction, the reed having to be hauled along the channel to the stack. Unlike the small wherry, that sails off happily, in other direction. Whether it’s a Norfolk bunch or an imported bundle, a thatcher would expect to use between 90 and 100 to cover the 100 sq. ft. square. Or around 10 bundles to a square metre. The thatcher now has to sort the reed into its various types, or Grades. Different parts of a roof require all the natural variations, in both length and taper, that should come with a good, mixed load of water reed. 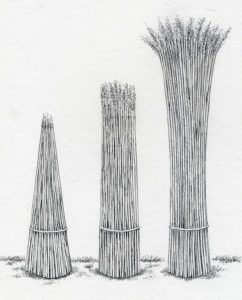 Water reed breaks down into three different types. The most useful are short and tapered bundles, known as Fine reed. As the top is much smaller than the bottom, it can be used to swing the thatch to the correct angle, in gables and hipped ends. The second type consists of good length reed, with some taper. This Medium grade reed, is used where no change of angle is required. The third, and hopefully smallest amount of material found should be Coarse reed. This can be defined as water reed, that is either bigger at the top than at the bottom or is not straight. It should still be of good lasting quality. Grades… The three types of water reed bundle. From the left; fine reed, medium reed and coarse reed. Each having a role to play, in thatching a roof. The one part of the roof were coarse reed comes into its own; is in a valley. Here the shape of the roof is ideal for top heavy bundles and any crooked reed allows air to circulate in the coatwork. This reed can also be used as backfilling. Which, as mentioned in the ‘Beginners Guide’, is placed in the coatwork to keep the thatch at the correct angle. 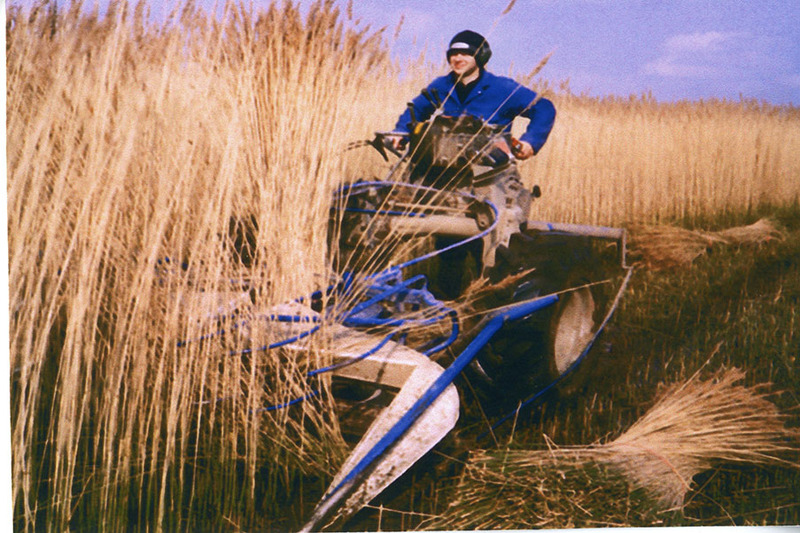 The danger for the thatcher is that there is too little fine and too much coarse reed in any one load…. Off the marsh… Well very nearly. 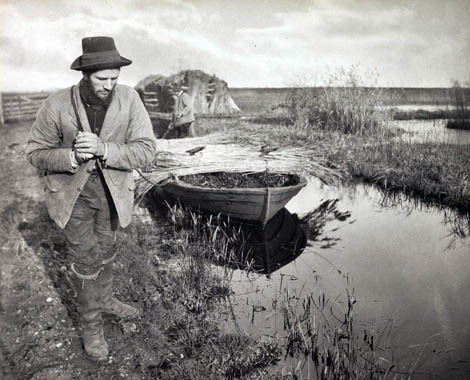 The old image shows the ‘reed staithe’ at Ranworth in Norfolk, over a century ago. 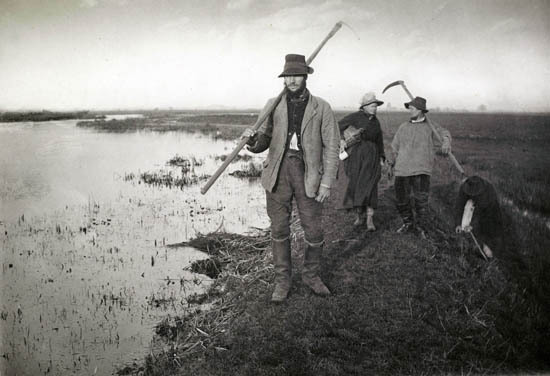 Not the only game in town… British water reed not only hails from Norfolk; beds on the River Tay have been harvested, since their planting in the 1770’s. This image dates from the winter of 1936/7. Showing reed cut at Mugdrum Island, being landed at nearby Newburgh, in Fife. Sedge grass has a long triangular leaf with serrated edges. Of which the thatcher has to be very wary, it’s lethally sharp. Gloves must be worn when using this material. The grass grows and is harvested, in similar conditions to water reed. The only difference being that it can be cropped all the year round. It varies in height, growing up to 6 ft. (1.8m), in a good situation. As with Norfolk reed, the crop has its own terminology. There are two types of bundle. If the material is long, then the cutter ties it in bundles of around 20lbs (9kg). With shorter sedge the harvester makes up Shoves, of around 7lbs (3kg). These shorter sheaves, are sold by the score.